Firer’s poem titled “Transubstantiation” is in the November 12, 2018 issue of The New Yorker. Susan Firer’s sixth and most recent book, The Transit of Venus, was named as an “Outstanding Work of Poetry” by the Wisconsin Library Association's 2017 Literary Awards Committee. Susan Firer was awarded a 2015 NEA Creative Writing Fellowship in Poetry. The fellowship is to “enable recipients to set aside time for writing, research, travel and general career advancement.” Download a list of the 2015 Creative Writing Fellowship winners. Nature poetry invites us to look more closely at the world, both large and small. In celebration of National Poetry Month and Earth Day, Schlitz Audubon Nature Center will host Wisconsin poets Brenda Cardenas, Susan Firer, Alessandra Simmons, and Angela Sorby to read from their work and discuss the evolving landscape of nature poetry, navigating the intersection of ecology, poetry, eco-justice, and our deep connection to the land. After the reading stay for a meet & greet with the authors and book signing. Books will be available for purchase. Firer’s poem titled “Transubstantiation” is in the November 12, 2018 issue of the The New Yorker. “Wilfred Owen Said” was in the Summer 2017 issue of the North American Review. “Hymn” was included in a bilingual edition of 100 Best Chinese and American Empathy Poems, edited by Professor Zhang Ziqing, Jim Cohn and David Cope. Firer's “Repetition Works for the Moon” was published in Matthew Zapruder's Column in the February 19, 2017, New York Times Sunday Magazine. Firer has four new poems in the Milwaukee anthology titled Return to the Gathering Place of the Waters (2017). Firer's poems “The Dog Stars” and “As If Made of Blue Legos” are in a Backwaters Press 20th anniversary anthology titled Watching the Perseids (2017). “Saint Valentine's Day, 1967” in the anthology Far Out: Poems of the 60s (Wings Press, 2016). “Vernal Ponds” was published in the 2016 Wisconsin Poets' Calendar. “Hymn” and “Repetition Works for the Moon” in Big Scream 54: Sacred Lands & Water Issue (Fall 2015). Firer's “The Song Asked if My Ears Were on Straight” appeared in the Spring 2015 North American Review. “Expect on Valentine's Day” in Wisconsin Poets' Calendar, 2015. “Whitman's Voice” in Little Eagle's RE/Verse on May 30, 2014. “Reading My Ántonia” in Verse Wisconsin 113, April 2014. “Dear New Year” in Wisconsin Poets' Calendar, 2014. “Memorial Day” and “Candlemas” in the anthology Burden of Light: poems on illness and loss, edited by Tanya Chernov (Fast Forward, 2014). “Here”, “Wind”, and “Bowling with Brides” in Verse Wisconsin 113-114, April 2014. On April 24, 2018, at Saint John's On The Lake Cultural Arts Center (1840 N. Prospect Ave., Milwaukee, WI, 53202), Firer read with Maurice Kilwein Guevara. On May 23, 2018, Firer, along with other poets published in The Return to the Gathering Place of the Waters anthology, was part of a reading celebrating the one year anniversary of the anthology. Susan Firer was one of the poets reading at Woodland Pattern's 37th Annual Anniversary Gala! The event was held on November 3rd, at Helene Zelazo Center for the Performing Arts 2419 E Kenwood Blvd, Milwaukee, WI. On June 15th, at 7:30 at Var Gallery, in Walker's Point, Firer read in the “Poets Read Some Stuff Someplace in Milwaukee” series, hosted by Sam Pekarske. Other readers that evening included Paul Vogel, Amanda Reavy, and Ton Johnson. Susan Firer and Deborah Fries read as part of the Moonstone Poetry Series at Fergie's Pub (1214 Sansom Street, Philadelphia, PA) on Wednesday, April 12, 2017, at 7pm. 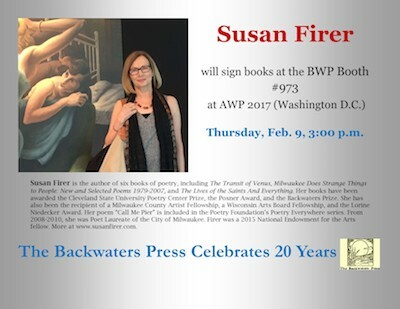 On February 9th, Susan Firer had two events in Washington, D.C. at AWP. From 10:30-11:45am, Firer was part of a reading titled: The Backwaters Press Celebrates 20 Years, in celebration of the press and a new anthology titled: Watching the Perseids: The Backwaters Press Celebrates 20 Years, at USC Dornsife Bookfair Stage 2. The second event was a book signing, at 3pm at the BWP Booth #973. For more information see the flyer. On Thursday, November 3rd, 2016, 7pm, Firer read from her newest book of poems The Transit of Venus, at Boswell Book Company, 2559 N. Downer Ave., Milwaukee, WI, 53211. I’d like to invite you to join cream city review for an amazing literary community event at Cream City Live! 40th Anniversary Celebration. Not only will the Mayor proclaim April 15th the City of Milwaukee’s cream city review Day, but there will also be a very special reading featuring work by Wisconsin Poet Laureate Kimberley Blaeser, former Milwaukee Poet Laureate Susan Firer, and Ihab Hassan, whose work will be read by cream city review’s incoming faculty advisor Liam Callahan. Please visit the link above or cream city review's official webpage for other information regarding cream city review. The event will take place on Friday, April 15th from 7-9 p.m. In UWM’s Greene Hall (3347 North Downer Avenue). On Friday, March 25, 2016 at 7:30 p.m. at the The Penthouse/Loft Space at Kenilworth Square East, RM 620 (1925 East Kenilworth Place, Milwaukee), Susan Firer will read Ginsberg's “Howl” as part of Pioneers of the Art. 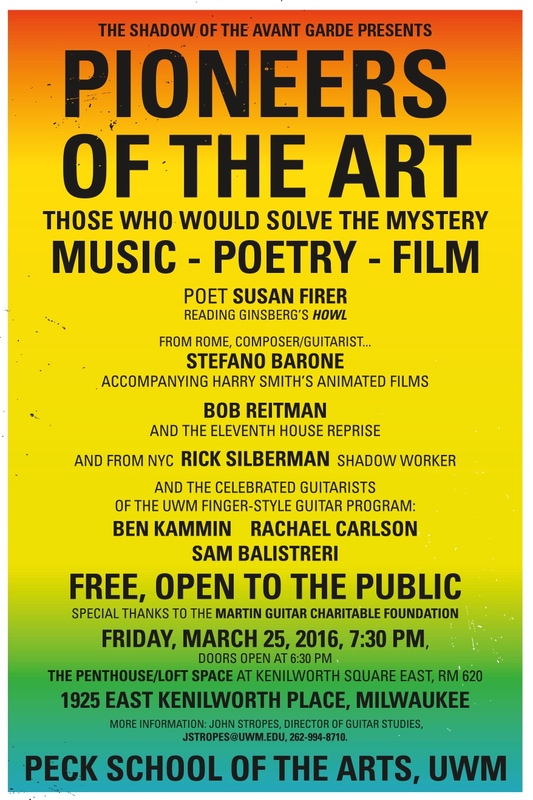 Others performing include Stefano Barone, Bob Reitman, Rick Silberman, Ben Kammin, Rachael Carlson and Sam Balistreri. For more information see the poster. On Saturday, February 13, 2016 at 2 p.m. at Milwaukee Public Library's Centennial Hall (733 N. Eighth St. Loos Room), Susan Firer read as part of an event focusing on Found Poetry, which Matt Cook, Milwaukee's current poet laureate, has orchestrated. Other poets reading that day are Matt Cook, Timothy Kloss, Kiki Anderson, Philo T. Ogden, Zack Pieper, Mike Hauser, Grace Mitchell and Soham Patel. Susan Firer, Tobias Wray, Lindsay Daigle, and other special guests read at Juneau Park on Tuesday, August 11, 2015. The event was organized by the Juneau Park Friends and took place at the Solomon Juneau statue. Monday, June 8, 2015, at 7:00PM, as part of the Schlitz Audubon's World of Nature Series. Susan Firer will read a selection of poems of place, featuring poems connected to Lake Michigan and other works that use nature's imagery. The reading will be at the Schlitz Audubon Nature Center (1111 Brown Deer Road, Milwaukee). On Saturday, April 25, 2015, Susan Firer will be part of Michael Feldman's live Whad'Ya Know Radio Hour broadcast (10AM to noon) at the historic Pabst Theater in downtown Milwaukee. On April 22, 2015, at 7:30 PM, as part of The Ineluctable reading series, Susan Firer and Keith Gaustad will read at Microlights (2543 N. Bremen St.). Susan Firer's poetry was part of composer and performer Jerome Kitzke's April 10, 2015 concert, Jerome Kitzke: Winter Count and Howl! Music in Poetry - Poetry in Music, at the South Milwaukee Performing Arts Center. On January 2, 2015, Firer, along with Paul Hansen Clark, Amanda Huckin & others, read at People's Books, as part of the “Supplementary launch” for BURDOCK XIV. Susan Firer read with Dorothea Lasky on April 26th, 2014, at Woodland Pattern, Milwaukee, WI.